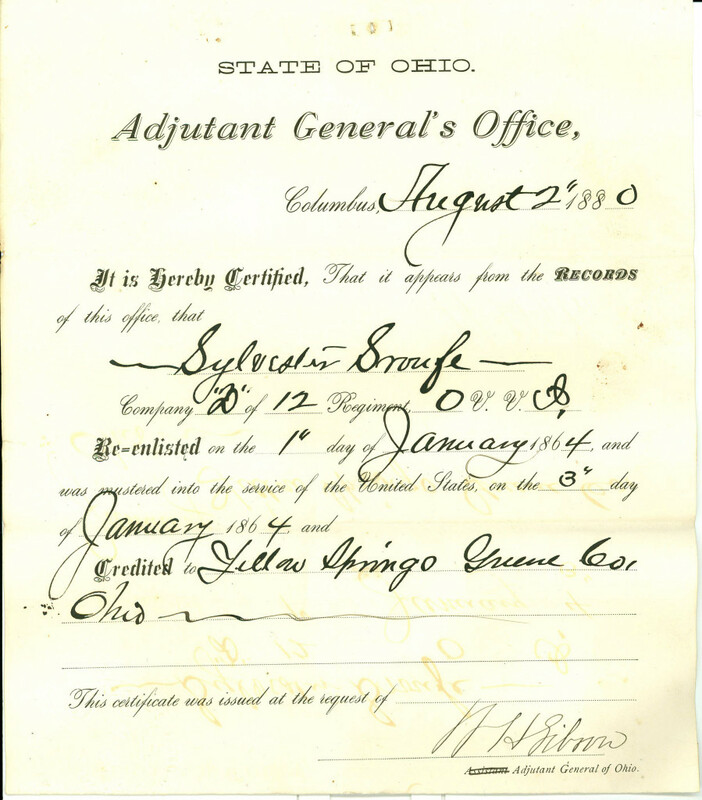 This document, issued through the Ohio Adjutant Generals Office in 1864, states that Sylvester Sroufe re-enlisted on January 1st, 1864, in Company D of the 12th Ohio Volunteer Infantry Regiment. 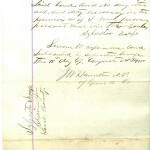 Sroufe was in the process of claiming a local bounty (extra payment for enlisting) that he had not yet received. 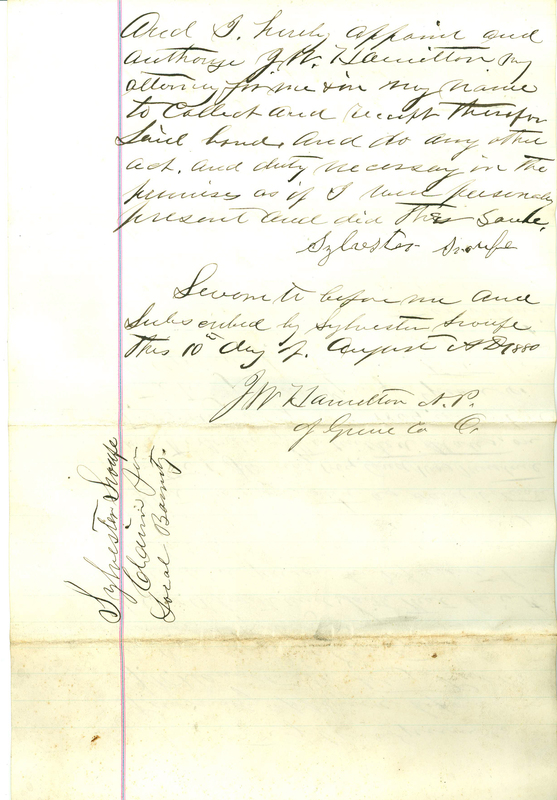 Born in January 1825-26 in Yellow Springs, Sylvester Sroufe was occupied as a carpenter and cabinet maker. The 12th O.V.I. was raised in May 1862 in Greene, Miami, and Butler Counties, and was trained at Camp Dennison, near Cincinnati. It was first designated as a 90-day unit, and in June of that same year re-enlisted for three years service. The unit first saw action at Scary Creek, West Virginia, four days before the First Battle of Manassas. It continued to serve in West Virginia, fighting secessionist guerrillas. They also participated in the battle of Antietam, where they saw heavy fighting. 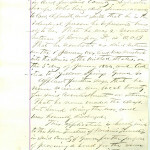 The unit disbanded in July of 1864 with a total of 175 casualties throughout the war. Many of the survivors subsequently joined the 23rd OVI for the remainder of the war. Sroufe survived the war and died in 1909. He is buried in Enon Cemetery, Mad River Township, Ohio. To read the additional pages of Sroufe’s claim, click on the documents below to enlarge. 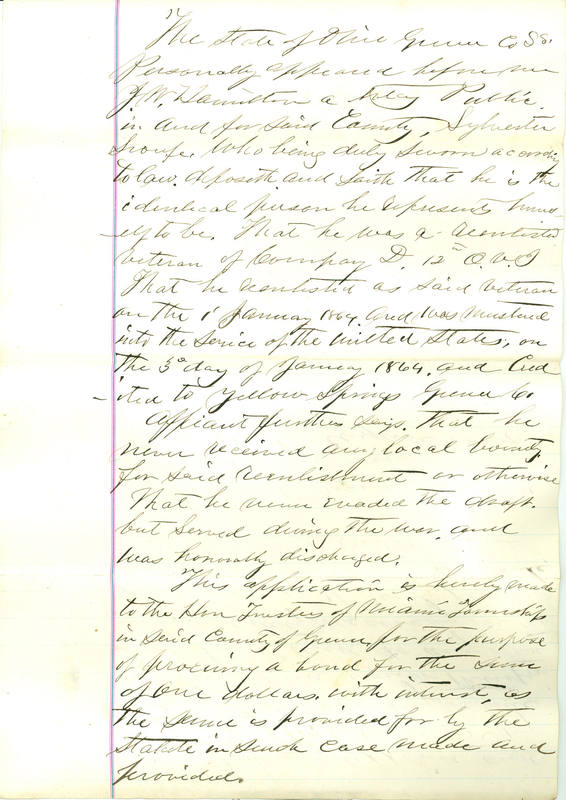 This entry was posted in Civil War, Collections, Local History, SC&A and tagged 12th Ohio Volunteer Infantry, 12th OVI, Andrew Clinard, Civil War, local history, manuscripts. Bookmark the permalink.